On Sale Now! Save 7% on the Brooks Women's Levitate Black/Ebony/Silver 8.5 B US by Brooks at Official KS Outlet. MPN: 120258_1B004. Hurry! Limited time offer. Offer valid only while supplies last. The Brooks® Levitate running shoe is designed with the highest energy return possible so you will rise to every challenge you meet on the road. 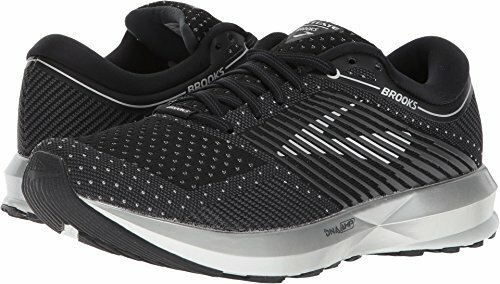 The Brooks® Levitate running shoe is designed with the highest energy return possible so you will rise to every challenge you meet on the road. Predecessor: N/A. Support Type: Neutral. Cushioning: High energizing cushioning. Surface: Road. Differential: 8mm. 3D Fit Print and FitKnit upper moves and expands along with your foot for an incredibly comfortable fit. Lace-up closure delivers a secure, adjustable fit. Padded tongue and collar for added comfort. Smooth fabric lining offers a great in-shoe feel. Removable cushioned footbed for added underfoot support and shock absorption. DNA AMP midsole features polyurethane foam, wrapped in a TPU skin, that captures the energy created by each foot strike and gives it no place to go but up - straight back to you. Durable rubber outsole has a flexible arrow-point pattern that helps you move from heel to toe quickly without ever losing energy. Imported. Measurements: Weight: 10 oz Product measurements were taken using size 8, width B - Medium. Please note that measurements may vary by size. Weight of footwear is based on a single item, not a pair.